The complete first season of "Cosmos: A Spacetime Odyssey" was released on June 10, 2014. If the finale of Fox's 21st-century take on the iconic "Cosmos" science TV series has you hungry for more celestial goodness as told by astrophysicist Neil deGrasse Tyson, you're in luck. The complete series hits stories today and is as dense as a neutron star with cosmic special features and other surprises. Fox is releasing the 13-episode "Cosmos: A Spacetime Odyssey" on both DVD and Blu-ray, and there are plenty of special features to keep dedicated fans of the "Cosmos" reboot busy for hours on end. The disc set includes audio commentary of the first episode, called "Standing up in the Milky Way," and a special feature about "Cosmos" at Comic-Con in 2013. The set also includes a five-part documentary about the making of the series, and even a big surprise for people that watch every extra. The Spaceship of Imagination soars through the universe in "Cosmos: A Spacetime Odyssey" on Fox. The final episode airs Sunday, June 8. "Cosmos: A Spacetime Odyssey" is a reboot of Sagan's classic 1980s TV show, "Cosmos: A Personal Voyage." One of the extras pays homage to Sagan by showing viewers footage from the U.S. Library of Congress' dedication of the Sagan archive in Washington, D.C.
A plethora of scientists came out to dedicate the archive in November 2013. Tyson spoke about Sagan's legacy and the astronomer's influence on Tyson's own life. Seth MacFarlane, the producer of "Cosmos: A Spacetime Odyssey," also spoke during the dedication. The "Family Guy" creator donated money that allowed the Library of Congress to procure materials for the Sagan archive. "I've been affected and inspired by the work that Carl Sagan and Ann Druyan have been doing since I was a kid," MacFarlane told reporters during the dedication last year. "When I found out that this was being discussed, and having the papers [installed] in the Library of Congress was something that was being considered, I thought, 'Well, here's some small way I can give back to these folks who have given so much to me and so many science enthusiasts and the general public.'" The Blu-rays also come with an exclusive feature not included on the DVD set: an interactive cosmic calendar that takes users through the 13.8-billion-year history of the universe, according to "Cosmos" representatives. 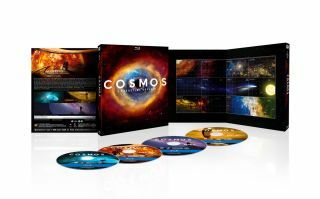 The "Cosmos: A Spacetime Odyssey" DVD set is available on Amazon.com for $24.99, and on Blu-ray for $29.99.